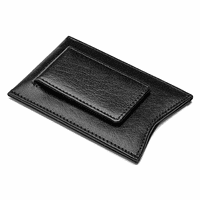 Combine compact, lightweight convenience with genuine leather style in this unique money clip wallet! 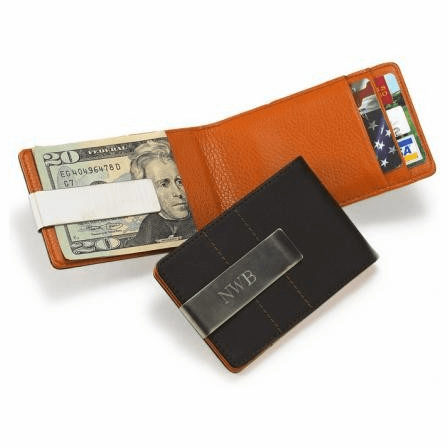 The two tone black and rust leather folding wallet has two slots for credit cards on one side, and a stainless steel money clip on the other that holds 10 to 15 folded bills. Add a special touch with free engraved name or initials on the exterior money clip band. 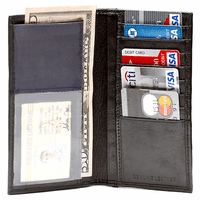 This wallet fits easily in a pants or jacket pocket without adding bulk or extra weight, and is a stylish way to store and organize your cash! i was thinking about buying these as groomsman gifts. I need 6 total but I want to engrave each of them with different characters, while only placing one order to save on shipping. How should i proceed. Also, any discount for buying 6? 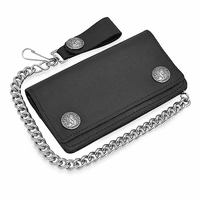 You'll need to add the first wallet, with its engraving instructions, to the shopping cart. Then, hit the keep shopping button to return to the wallet page. You can enter your second set of engraving instructions and add the second to the cart. Repeat this until all of the items you need are in the shopping cart, then you can check out and have them shipped together. We'd be happy to offer you 5% off, just use the coupon code egscoupon105 at checkout. I would like to have a logo engraved, is this possible? I have attached the logo I would like engraved. Please let me know ASAP. Hello Is there way to pick a different font than what you offer? Also i need to order 10 is there a discount for the quantity and how do I send you the initials needed? There is a discount of 5%, just use the coupon code egscoupon105 at checkout to receive the discounted rate. We can engrave other fonts, just let us know in the comments section of our checkout page the font you'd like. As for ordering multiple wallets with different engraving, you're going to add the first one, with its individual initials, to the shopping cart. Hit the "Keep Shopping" button to go back to the item page and add the next. Repeat this until all your wallets are in the shopping cart and you can check out. Hi there I have a couple questions. The pictures are kind of confusing is the clip where the engraving is on the inside or the outside of the wallet or is there 2 clips. Is there any chance I could get a different font, Im not crazy about the 4 choices And is there any way I could get a discount if I order 6? Thank you! Sorry for the confusion, the money clip is removable and goes over the leather flap, so its on both the inside and the outside. Email us back what font you're looking for and we'll see if we have it in our font library. For an order of six, you could receive a 5% discount, just use coupon code egscoupon105 at checkout. Thanks! Does the money clip come off or is it attached? The money clip is not attached, it comes off. Is the personalized name written on the outside of the money clip or inside. Is it possible to get written on the inside and the outside? The engraving is normally done on the inside. We can definitely engrave both the inside and the outside for you. You won't be able to enter that information on this page though. Just let us know in the comments section of the checkout page what you would like engraved on each side. Does this item come in another color? Sorry, this wallet/money clip only comes in the color shown. Does the flat side of the money clip go on the outside of the wallet, or does the side with the arched end. Also, what side does the engraving go on. The arched end goes on the outside. The engraving goes on this side of the money clip as well. If you would like the engraving on the completely flat side of the money clip, let us know that in the comments section of the checkout (billing/shipping) page. my fiance and i are getting married in july. we were going to get these for the groomsmen as the gifts. how do you put the initials on the money clips? The initials are engraved into the metal money clip. I see there are only 2 card slots but my boyfriend carries two cards and ID. Is one of these slots able to hold two cards? While the Metro Leather Wallet and Money Clip can hold 2 cards and an ID, it is a very tight squeeze. Your shipping would be free of charge and we can offer you 10% off on the knives. Just use the coupon egscoupon110. The leather only comes in the the color shown. I am interested in order 120 of these wallets with our company logo (actually would need a logo on each side of money clip). What is the turnaround time for an order such as this? We can definitely do this for you and we can have your order shipped within 2 business days. We would need you to send the logo to help@executivegiftshoppe.com, preferably in black and white adobe illustrator .eps format. We'll email you back a proof and a quote. Sure, we can do that for you. 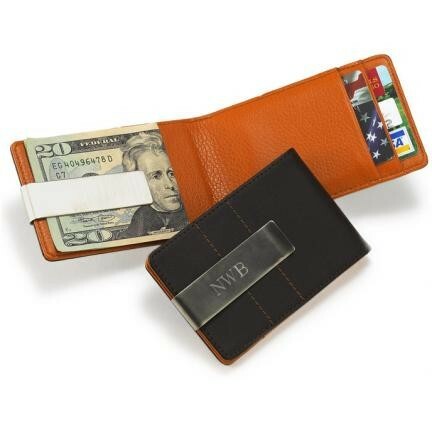 Just enter the engraving you would like in the comments section of the billing/shipping page after adding this wallet with money clip to the shopping cart. Be sure to be specific about which line you would ike on the arched side and which line you would like on the flat side. Very nice and will be used a lot. Well made and was what I wanted. ProsThe money clip had a small defect, called and WOW no problem. I was greeted and whit no problem they send a new one. This company stands behind there products, I HIGHLY RECOMMEND THEM. THANK YOU SO MUCH. This wallet was a gift. He really enjoyed having a wallet small enough to fit in front pocket and large enough to carry what he needed. Thanks for a great gift. We ordered 18 of these as senior gifts for football team.THEY LOVED THEM. They started to put there ID's and money in them right at the dinner and saying cool and smiling. I ordered on a sat received gifts by wed. When I contacted by phone, a person answered phone. no press 1 press 2 ... that was great. He was very courteous and extremely knowledgeable. They took a special request to engrave a football image on line 1 of engraving at no extra charge..and when they arrived we were so impressed by the high quality of artwork the football was. The colors are much more nicer than the picture appears .Leather Very dark brown and rustic orange are very tastefuland money clip a beautiful bronzegold. You could smell the leather as well as feel. Highly recommend this product and executive gift shoppe. I will be a returning customer for sure. ProsQuality leather and quality stitching. personalized engraving was impressive. lifetime guarantee.Excellent customer service. received product fast. I purchased this for my nephews 16th birthday. He wanted a money clip and this was thin with the clip and 2 holders for ID and Gas Card. Also his school colors are brown and orange so this was a perfect fit. Saw a similar one elsewhere for triple the price. This is great quality leather. The inner color is bold and fun and I was able to monogram the money clip with his initials. Big Win!! Great quality and the delivery was outrageously fast, I was very impressed!!!! My Husband just loves his new wallet clip- the best of both worlds. This slim yet chic product is perfect. 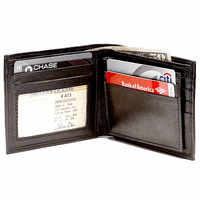 Great for someone who does not need or is not use to a bulky wallet. Wonderful for the price. Awesome Buy! Nice product for holding money and just a couple cards/ID. Would not be able to hold more than that. Looks great and can be easily carried in front or back pocket comfortable. I gave it to my husband for Christmas and it was exactly what he was looking for - something small that could be used to carry money and ID and would be comfortable in a front or back pocket. used the wallet for credit cards. covers your items, yet is very slim.